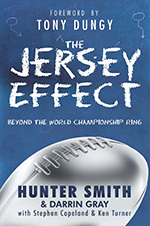 Home > Blog > Announcing “The Jersey Effect” Book Release! I can’t think of a better time to release The Jersey Effect. But perhaps that’s what makes the timing of this book appropriate. The 2011-12 season marks the five-year anniversary of bringing the Lombardi Trophy to Indianapolis. In this book, we reflect on that improbable Super Bowl run. The last couple weeks have also marked the denouement of the Dungy Era, as Colts management has fired much of its coaching staff that had Tony’s fingerprints all over it. In this book, we remember that record-setting era that brought so much joy to Hoosier households. You see, it would’ve been perfect for the Colts to make the Super Bowl this year. With so many injuries last year, so many free agents this year, and the Super Bowl in Indianapolis in 2012, another attempt at capturing the Lombardi Trophy would’ve been a storybook ending. Heck, anything would’ve been better than Bah-stonians taking over the Indy streets with Brady jerseys. But instead, we get the worst-case scenario. Peyton down. Season drowned. Rival in town. UnLucky. But that’s life. After all, Tony Dungy’s last game was when the 8-8 Chargers upset us in the playoffs—a year everyone expected to end with another parade in downtown Indy. Jim Caldwell’s last season with the Colts was this one—a year where the Colts finished 2-14, only two seasons after advancing to the Super Bowl. And my last play of my 12-year NFL career was a dropped snap that got me cut and lost us the game. In life, you’re going to lose some times. (I’ll stop there before I give away all of Chapter 12 and torque off my publisher…again.) The point is this: We all taste defeat. We’ve all had to swallow our pride. We’ve all seen our nemesis take something that we wanted. According to Romans, this week’s gonna build a heck of a lot of character. I can’t wait to read this book! What a fantastic idea to write about sports in thie manner. Best of luck with this book! how can I order a copy of this book…not an ebook thanks! The book will be available June 1 and you can order it here on our website. Thanks for asking, we hope it will make a huge difference in a lot of people’s lives as they seek to see sports, competition and life through the eyes of some guys who have experienced Super Bowl success.